A basic understanding of Swift and PHP are needed to follow this tutorial. Many applications come with a section where users can comment on the item they are previewing. When a comment is posted, while you are looking at this item, the best UX is to see the comment immediately as it is made by the user. 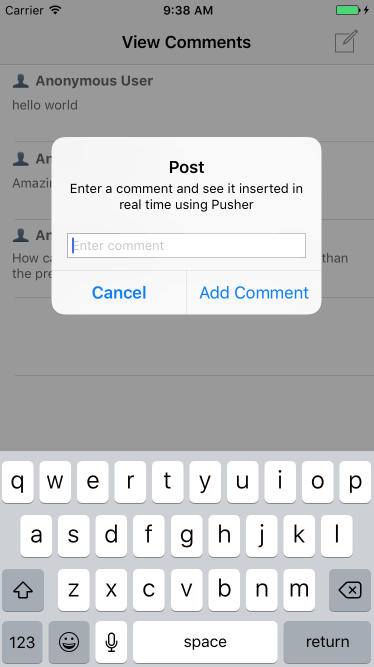 In this tutorial we will demonstrate how we can achieve a live commenting feature using Pusher on an iOS application. Create a new project on XCode and call it whatever you want. We will name ours "showcaze". You can simply follow the wizard XCode provides. Select the single page application as the base template. Once you are done with this, you will need to prepare the dependencies to be used by the application. The easiest way install dependencies is by using CocoaPods. If you don’t have CocoaPods installed you can install them via RubyGems. And then run pod install to download and install the dependencies. When cocoapods asks you to, close XCode. Now open the project_name.xcworkspace file in the root of your project, in my case, the showcaze.xcworkspace file. This should launch XCode. Note: Because we are using the latest version of XCode which contains Swift 3, we are using specific dependency versions that are compatible with it. You might need to use a lower dependency version tag depending on your XCode and Swift version. We want to display the available comments and then allow people to add comments to this list. When we are done we want to have a simple view just like this. Open the Main storyboard and delete the current View Controller scene. Drag a new UITableViewController into the scene. Create a CommentsTableViewController and associate the newly created View Controller scene with it. Finally, while the view controller is selected in the storyboard, from XCode toolbar click Editor > Embed In > Navigation Controller. After this, you should add the labels as needed to the prototype cell, add a reuse identifier and create a CommentTableViewCell class and make it the custom class for the prototype table cell. @IBOutlet weak var comment: UITextView! Note there are two @IBOutlets in the class. You need to create the cell label and text view then Control + Drag them to the CommentTableViewCell class to create IBOutlets. To highlight some important parts of the code, lets break a few down. This function basically initialises the Pusher Swift SDK, subscribes to a channel's comments, listens for an event new_comment and then fires a callback when that event is triggered from anywhere. In the callback, the text is appended to the top of the table data, then the tableView is updated with the new row. This block simply adds a compose button at the right of the navigation bar. It fires a buttonTapped callback when the button is well tapped. The buttonTap callback launches an alert view controller with a text field where the comment text is supposed to be entered in. Create a new Pusher account (it's free) if you do not already have one. Create a new application and retrieve your keys. This is the key you will use above. When you have your keys, you can plug it above and also below in the back-end service. Now that we have our application subscribed to the Pusher event and also posting comments, we will have to build a backend to support it. For the backend, I have made a simple PHP script. It will be uploaded as a part of the repository. You will need to host somewhere if you wish to use the demo, we have chosen Heroku for this. Now that we have the server running, whenever you make a comment on the application, it will be sent to Pusher and then the page will be updated with it. 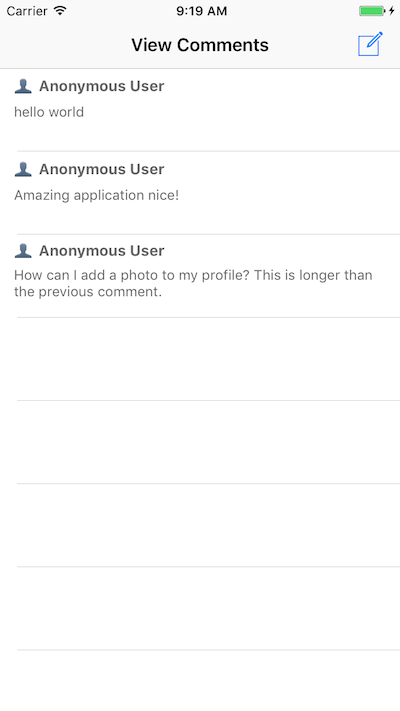 Now we have built a live commenting feature for your iOS app. Hopefully, you have learnt a thing or two on how to use the Pusher iOS Swift SDK to make realtime updates to your iOS application. If you have done something great on your own, leave a comment below and share it with us.